The weather in Maine has not been "normal" at all. For instance, in the past week we had our 2nd snow storm of the season. But then we've ended the month with 50 degree days! It's crazy that I went out to recess duty today without a jacket - on the last day of November. That just doesn't happen in Maine. 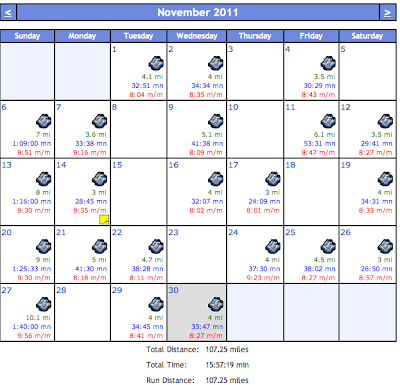 Anyway, looking back at the month, I am surprised with my mileage. 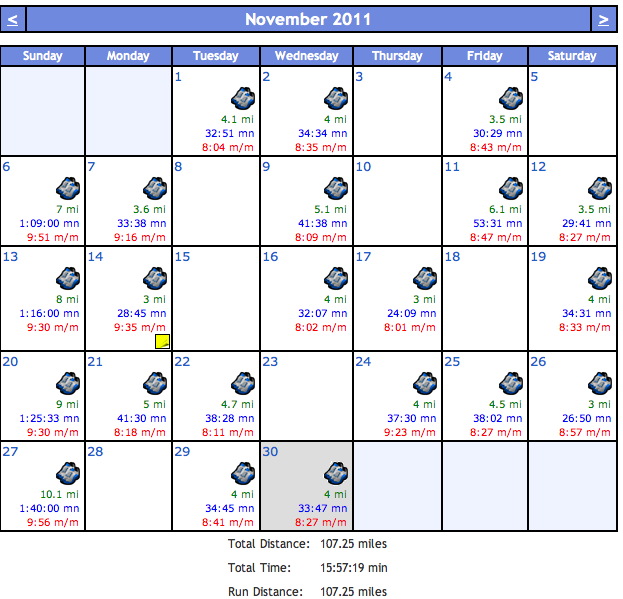 Last November, I logged 84 miles. I'm liking the progress I've made in the past year. 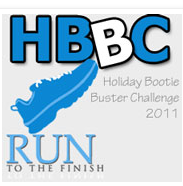 Last night Ward was telling me that I have surpassed what he thought I was capable with running. He's so sweet. Of course, it all stemmed from a disagreement about me and chopping wood. I told him I couldn't do it. I have tried, and I just cannot figure it out. He reminded me that I used to say that about running. Jeez. It looks like I have a new challenge: to figure out how to chop wood. Ugh! Thursday & Friday - we'll see! So far - 36.6 points. I am loving this challenge! I know some other challengers have mentioned the 7 servings of fruit and veggies being a challenge. I eat all day long, really I do. Having the opportunity to earn a point to eat 7 servings of something I love is awesome news to me. I find myself stuffing my lunch bag in the morning with 2 apples and 2 bananas. Then I often have a veggie of some sort at lunch. Most of the time I have a fruit in the morning for breakfast, so that leaves only one more fruit or veggie to eat at dinner. Oh & my Yankz came on Monday! Thank you Bobbie! I was feeling bad that I had won a few things already and when they came, Tucker was so excited about them, so I let him have them. I'm nice like that. Woah, more than 100 miles! Congrats! Wow, 100 miles this month! That is great! Yea for your miles! That's great! And it can stay this temperature all winter, I'd be very happy! You have certainly been lucky lately! I love a 100 mile month. Congratulations!